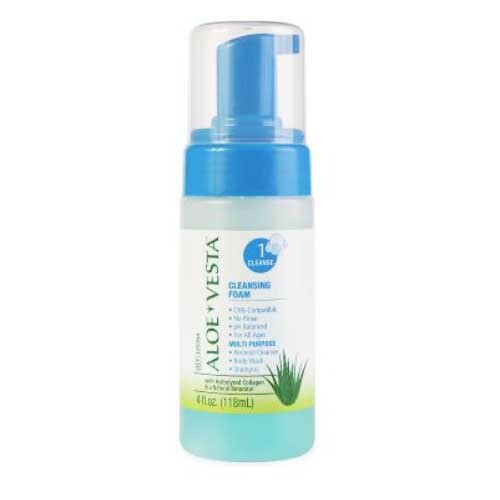 Convatec Aloe Vesta Cleansing Foam is a non-aerosol incontinence skin cleanser has an extra layer of aloe that helps soothe the skin and retain moisture in the lower dermal layers. This pH-balanced, CHG compatible foam can be used on the entire body including the hair and perineum. The foam doesn't require any rinsing and offers a "clean" scent so you'll feel like you just left the shower. The pump bottle makes it easier to access. The pump bottle comes in four and eight ounce pump bottles and has a pH balance of 7.5-8.5. 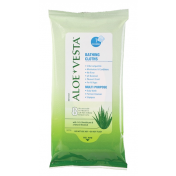 If we use Aloe Vista as a prep in the Operating Room, is there a standard prep recommendation? Dry time, scrub time? We use this if there is an iodine allergy as a vaginal prep. We cannot offer that information regarding those specific details for this product. We recommend contacting the manufacturer for a clearer answer. In what areas can this be used? 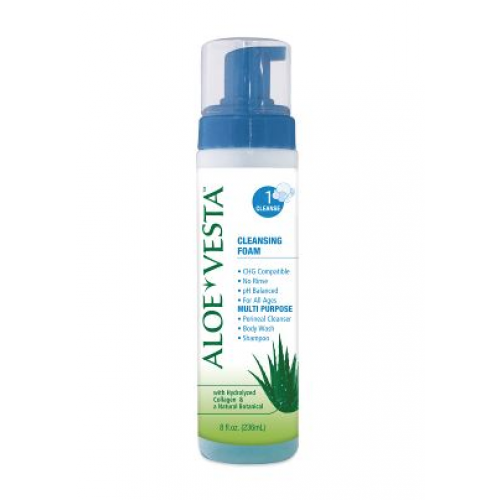 The cleansing foam can be used all over the body for cleaning. 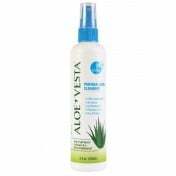 If you use water in addition to the aloe vesta product, does it remove the antimicrobial effects? It may remove some of the antimicrobial effectiveness but there's no complete removal to the effectiveness of the product. I became familiar with Aloe Vesta while caring for my mother when Hospice ordered it. After she passed, a bottle of it was packed with some things that I brought back from her house. I suffer(ed) from Rosacea for about 3 years and the $300 quarterly Rx that my doctor prescribed for me only dried out my skin and actually made it worse. I tried finding an aloe vera plant in our area and then discovered this product among the items brought home from my mothers. 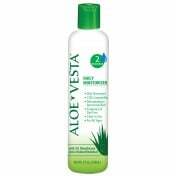 I know Aloe Vera is very good for many things and decided to wash my face with it. Almost overnight the redness, swelling and soreness of the Rosacea was gone. I apply it and leave it on, no need to rinse really. No more dry skin, no more peeling and it left my skin feeling supple and looking healthier again. 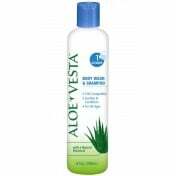 I now order Aloe Vesta for my skin. I am 66 years old and many people do not believe it. They actually think I am in my 40's. 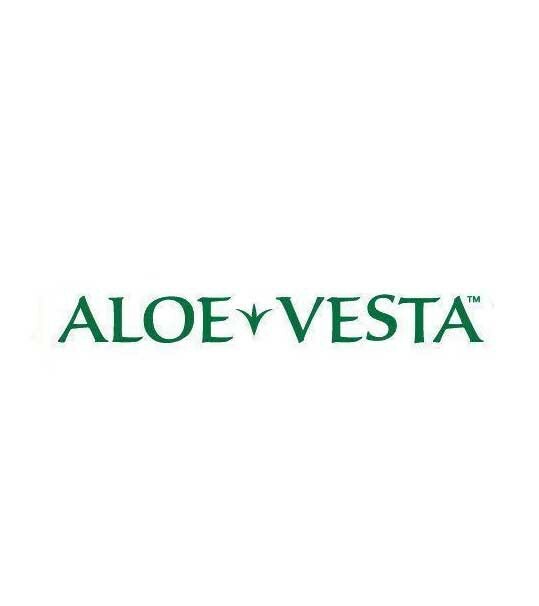 LOVE ALOE VESTA. Really love this cleansing foam. It works wonderfully. 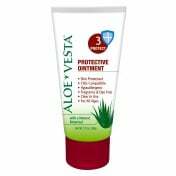 This product is the only thing that will work on my skin infections due to cellulitis. I'm giving it 4 stars only because it keeps the skin clean, but does nothing for odors, unfortunately. This is the second time I have used this product due to inability (medical/physical limitations) to shower or bath normally. This product is gentle, moisturizing, and has a very mild scent. I would not have chose to use it again if it didn't deliver. 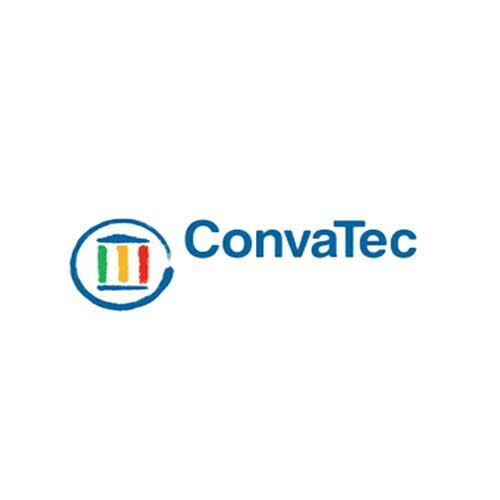 There are so many companies out and every one says that their products are the best. I must say the Vitality Lives up to their standards and their products. Truly your company cares about their customers and the patients, and the products help heal and ordering is very easy. The staff is very professional, even if there is a mistake, they quickly correct it. Thank you for helping me and helping my love one to heal. We have been using this on my mother for a couple years. It is great, I have not found anything near its results. She has been in diapers for almost two years, and bed ridden for almost a year. We have not had any skin breakdowns. We could not survive with it. i never write reviews on anything, but ive struggled with acne since highschool and im now 26 years old, i discoverd this when taking care of my grandfather and it cleared up my face blemeshes and acne within a week, ive just reciently tried using nutragena "grapefruit acne cleanser and it just about melted my skin and looked like i went face first into a wood chipper...i will most definitly be going back to using this stuff!!! 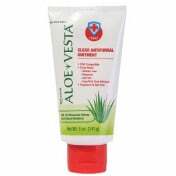 I use aloe vesta cleansing foam every time I check my blood sugar. I check it often. Smells nice, doesn't dry out skin. Wonderful for those who are bed bound, and cannot take a regular bath or shower.